Soursop and Moringa important plants that may fight serious diseases like cancers! What follows is a letter from a gentleman addressed to me and some of my associates. Please be aware that I truly appreciate the kind words and I am truly honored to have received such an amazing letter. The original letter is at the bottom of this page. I have retyped it with some minor additions in parenthesis.I did not spell check the letter so you may find some spelling errors. Please note that our nursery is located on 3.5 acres and is a combination nursery, restaurant, garden and event venue. We have a weekend farmers market and also a coffee shop that offers entertainment in the form of live jazz, comedians and more. We are under major construction and we will be one of the most unique places to shop for plants, fruit trees, fruits and vegetables and you can even take classes on gardening, yoga, art and much more! We are open for business Wed-Sun so stop on over and say hi! I contacted Mr. Lorie by telephone the day the letter arrived and he gave me permission to post it here on the web. He wants everyone to know about alternative remedies like Soursop and Moringa. Please keep Andrew, Mr. Lorie's grandnephew in you prayers and pray for others who need the healing power that prayer provides. Work with your doctors and let them know what herbal remedies you are considering. Some doctors are more willing to allow the use of Herbal extracts, teas etc than others. Now with that said, please keep in mind that I make no healing claims as to the effectiveness of any fruit tree or herbal plant sold by my nursery or obtained from any source. Always work with your health care professionals and don't trust anything you can't verify. Our goal is to grow and sell the finest fruit trees and it looks like we are on the right path. Again we are not trained in medicine of any kind. We do not offer any medical advice! Ultimately the responsibility for the choices you make are yours. Choose wisely and keep a positive attitude. Is with great pleasure and admiration that I address these few lines to you in appreciation as to the manner in which you received us at your humble place of business on a very difficult Sunday for us after having traveled 320 miles one way, and I say gladly! Because only a person like you and Jorgito (Chef George) with such moral values, integrity, knowledge and a profound hart could have only been there to welcome us that Sunday. After you had learned the day before regarding our family tragedy involving our two and half year old grandnephew who was diagnosed with brain cancer. Upon showing us the 3 Soursop plants you had separated for us, instructed us as to the care of such along with a Moringa Miracle Tree, and a (Tilo - Justica pectoralis) tea plant. 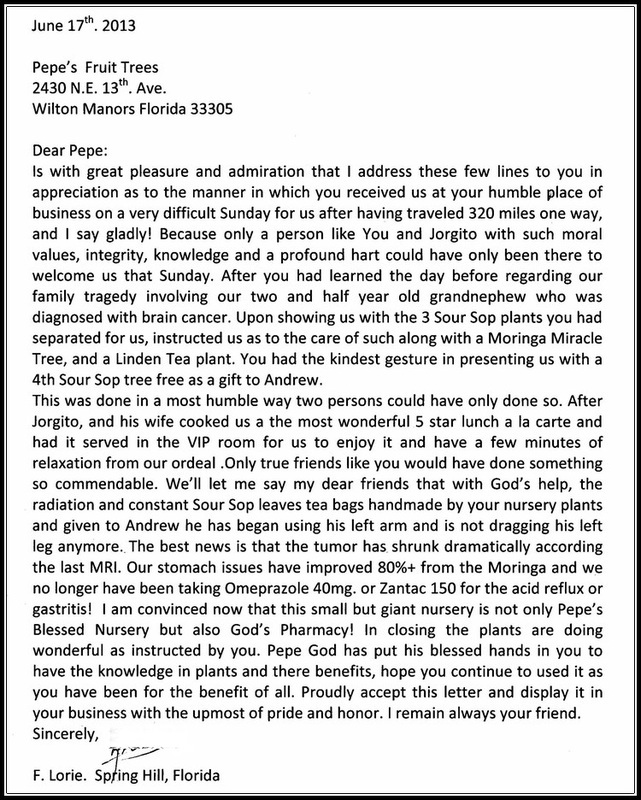 You had the kindest gesture in presenting us with a 4th Soursop tree as a gift to Andrew. This was done in a most humble way two persons could have only done so. After Jorgito (Chef George) and his wife (Chef Dee) cooked us the most wonderful 5 star lunch a la carte and had it served in the VIP room for us to enjoy it and have a few minutes of relation from our ordeal. Only true friends like you would have done something so commendable. We'll let me say my dear friends that with God's help, the radiation and constant Soursop leaves tea bags (we) handmade (from) your nursery plants and given to Andrew he has began using his left arm and is not dragging his left leg anymore. The best news is that the tumor has shrunk dramatically according to the last MRI. Our stomach issues have improved 80%+ from the Moringa and we no longer have been taking Omeprazole 40 mg. or Zantac 150 for the acid reflux or gastritis! I am convinced now that this small but giant nursery is not only Pepe's Blessed Nursery but also God's Pharmacy! In closing the plants are doing wonderful as instructed by you. Pepe God has put his blessed hands in you to have the knowledge in plants and there benefits, hope you continue to used it as you have been for the benefit of all. Proudly accept this letter and display it in your business with the utmost pride and honor. I remain always your friend. Disclaimer: Do not change or discontinue any medication or treatment without consulting your physician. These statements have not been evaluated by the US Food and Drug Administration. This information is not intended to diagnose, treat, cure or prevent any disease. Drink at your own risk and let your healthcare professional know what alternative health remedies you are considering before drinking any herbs or using any plant leaf as a food, tea or remedy!